WASHINGTON — Daily attempts by undocumented immigrants to cross into the U.S. from Mexico over the past month surpassed daily averages not seen since fiscal year 2006, according to Customs and Border Protection data obtained by NBC News. Those seven days are the highest on record since Trump took office, a DHS official told NBC News, and they have all been recorded over the past six weeks. The U.S. officials and a DHS official told NBC News they are working on a plan that would allow defense funds and personnel to be used in transporting immigrants in need of medical transport. The request from DHS includes the use of DOD land to build facilities that would house detained migrants while awaiting deportation or an asylum hearing. The Trump administration has already deployed thousands of U.S. troops to the border to help reinforce existing barriers, such as by hanging wire over fencing, and has plans to keep them there into September. Those troops do not have direct involvement with immigrants, and Defense officials are wary of having uniformed military personnel come in contact with or transport migrants, two officials told NBC News. Under a U.S. law known as the Posse Comitatus Act, the military cannot be used to enforce domestic law, drawing a barrier between troops and migrants. Undocumented immigrants crossing now, including those presenting themselves at legal ports of entry and those apprehended while crossing illegally, are overwhelmingly families. 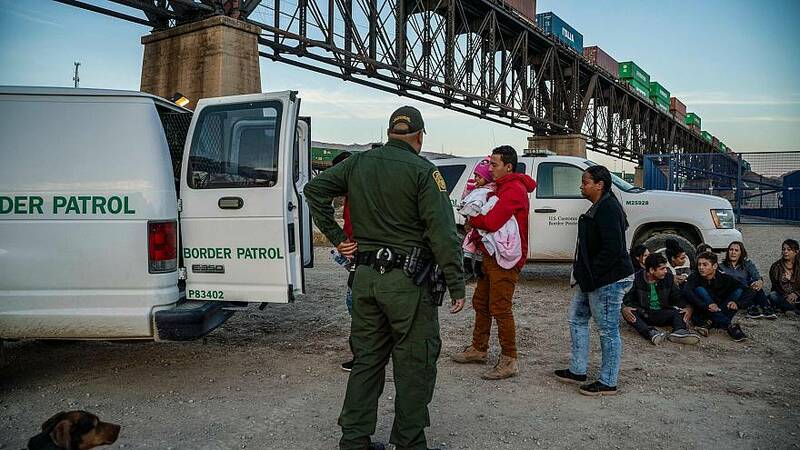 For example, on March 12, CBP encountered 2,022 migrants who arrived as part of families, meaning children and parents traveling together, out of a total of 3,834 migrants crossing that day. Children present new challenges for U.S. border agents. In December, two children died in CBP custody after making long journeys through remote areas to get to the U.S. Also, a federal court decision known as the Flores settlement keeps DHS from holding children, even those with their parents, in custody for longer than 20 days. The influx has caused CBP to begin releasing immigrants without transferring them to Immigration and Customs Enforcement (ICE) custody. The immigrants are often released in large numbers, overwhelming local charities and shelters, and given a notice to appear in court at a later date, according to a DHS official. The use of DOD land will allow DHS to find additional space to detain immigrants, rather than releasing them. Last year the Pentagon identified Fort Bliss and Goodfellow Air Force Base, both in Texas, as two possible locations to house migrants. It is not yet known what land will be identified or whether the detention space will hold families or single adults. A Pentagon spokesperson confirmed site surveys were completed at both Goodfellow AFB and Fort Bliss, but said no request has come in to begin housing migrants on U.S. military bases. "DOD will not begin constructing additional shelters until DOD receives a notice of intent from either DHS or HHS requesting that DOD start construction, with the first facilities due in 45 days," said Lt. Col. Jamie Davis. "At this time DOD has not received notification."